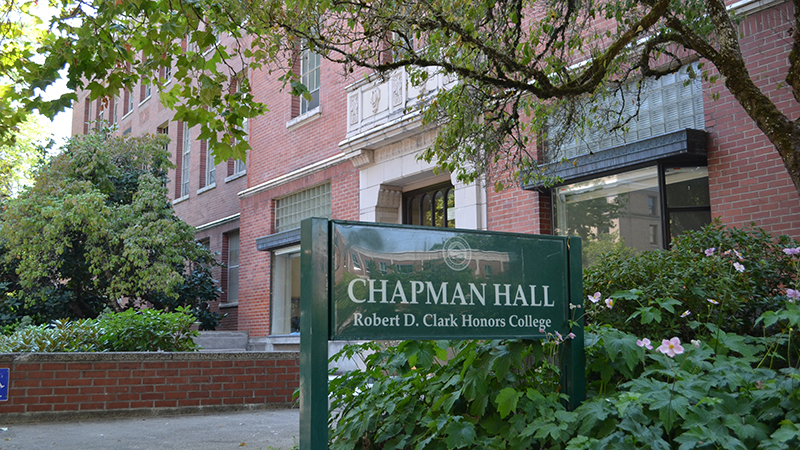 The UO’s Robert D. Clark Honors College recently was awarded the highest rating of five “mortarboards” in the latest edition of Inside Honors: Ratings and Reviews of Sixty Public University Honors Programs. The college increased its rating from 4.5 mortarboards in 2014, and in 2016 it is one of 11 programs across the country to receive a perfect score. Colleges and programs are not ranked individually, so all 11 programs are considered to be in the top 10, including ties. Launched in 2012, the publication — affiliated with the website PublicUniversityHonors.com — is the only independent, third-party reviewer looking specifically at honors colleges and programs at public universities. The rating is based on 13 categories, including the number of honors credits required for graduation, the quantity and disciplinary breadth of honors courses, class sizes, graduation rates, quality and availability of honors housing, ratio of students to program staff, access to priority registration and a record of students successfully competing for national distinguished scholarships. The 2015 addition of a director of undergraduate advising, who helps advise students on distinguished scholarships opportunities, was one factor in the higher rating. During the 2015-16 academic year, honors college students successfully competed for the Gilman, Boren, Fulbright and Gates-Cambridge scholarships. The college’s curriculum rating was an area of particular improvement, with emphasis on the number and disciplinary breadth of courses offered. In addition to the college’s core faculty, roughly 40 affiliated faculty from across the university teach in the honors college each year. Access to the resources of a top-tier research university, combined with the small classes and advising support of a small college, is one of the biggest reasons students choose to apply to a public honors college. At the UO, honors college students can take advantage of other highly ranked programs in architecture, business, education, law and more, and science majors in particular benefit from access to campus labs and research opportunities. The college has seen applications for its early admission cycle increase by 56 percent over last year. Applications for the college’s regular admissions cycle will be accepted through Jan. 15. Tours are available daily Monday through Friday. Learn more at honors.uoregon.edu.